(From left) Communication scholars and Cognella authors Deanna Fassett, Jimmie Manning, and Nicholas Zoffel celebrate Manning’s receipt of the 2019 John T. Warren Mentorship Award. San Diego, CA – April 17, 2019 – Recently, during the Central States Communication Association (CSCA) 2019 Annual Convention, Cognella authors were recognized for their extraordinary dedication and service to the communication discipline and CSCA. Additionally, panels on which Cognella authors and Cognella Communication Publisher Todd Armstrong sat received Top Panel designations. During the convention, Scott A. Myers was bestowed the 2019 CSCA Hall of Fame Award. The honor lauds his contributions to the discipline of communication through meritorious scholarship, teaching and mentoring, participation at conventions, and service to the association. Dr. Myers’ Cognella text, Communication and Relational Maintenance (coauthored with Marianne Dainton), will publish in late summer 2019, and his text on instructional communication is currently in development with Cognella. Jimmie Manning received the 2019 John T. Warren Mentorship Award. The award memorializes Dr. Warren, who passed away in 2011, by recognizing a mid-career scholar who exhibits some of the virtues Dr. Warren himself epitomized as a mentor, scholar, and engaged member of the discipline. Jimmie Manning is the author of the forthcoming text The Qualitative Coding and Analysis Guide for Communication Research. This year’s CSCA President’s Party celebrated Amy Aldridge Sanford’s incredible contributions to the discipline and the association. She is the current president of CSCA and the author of the forthcoming text, From Thought to Action: Developing a Social Justice Orientation. 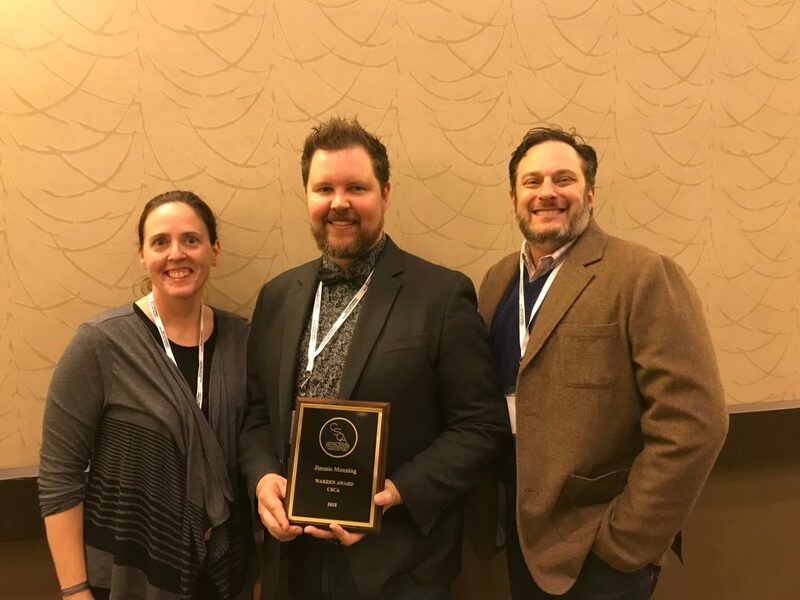 In addition, the following sessions, featuring Cognella authors and Cognella Publisher Todd Armstrong, who directs the Cognella Communication, Journalism, and Media Studies list, were honored as Top Panels at the CSCA convention. To see pictures from the CSCA convention, visit the CSCA conference recap webpage. The Central States Communication Association (CSCA) an academic organization of communication professionals including college and university professors, students, and K-12 educators. The associational consists of the 13 Midwestern states of North Dakota, South Dakota, Nebraska, Kansas, Oklahoma, Missouri, Illinois, Iowa, Wisconsin, Minnesota, Michigan, Indiana, and Ohio. It has grown to become the largest regional communication association in the United States and the fourth largest academic communication association in the world.